Oh I love this! I was wanting a chambray type shirt but not for $80. I need to check out Old Navy! Great find! I tend to go the save route if the items are so closely the same in style. Old Navy tops tends to fit better on me too. Can't beat that price tag! Great find! I would definitely go with the ON top! Cute find, I'd do Old Navy for a trendy item any day! NICE! 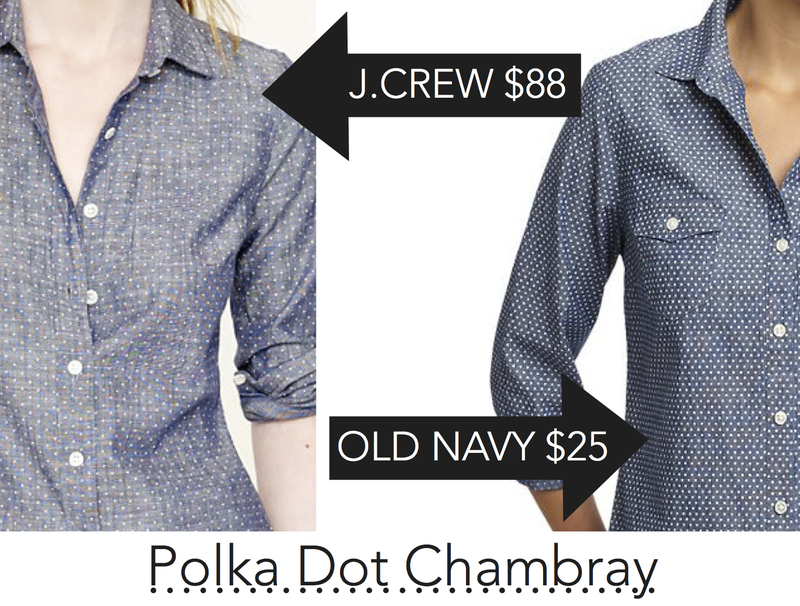 I love polka dots anything, and these shirts are fabulous! i need the old navy one in my life NOW! such a perfect fall piece! i think in this case you definitely go with save and not sacrifice the look ! Just ordered the ON one! Thanks for the tip!! Great reviews on ON too! I will be getting the ON one! Old Navy has seriously been stepping their game up! I love their version! old navy for sure...i may have to go and get it!! I don't get spending more money, when spending less will work better. Definitely don't forget to fade it though, stand out polka dots are hopefully NOT the rage.